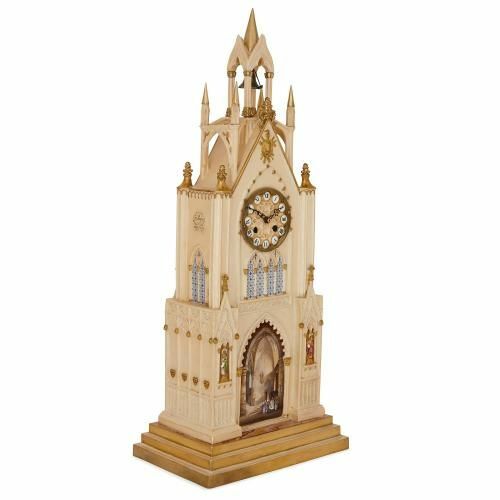 This delicately decorated porcelain clock is crafted in the intricate Gothic revival style and features truly exquisite trompe l'oeil style painted details. 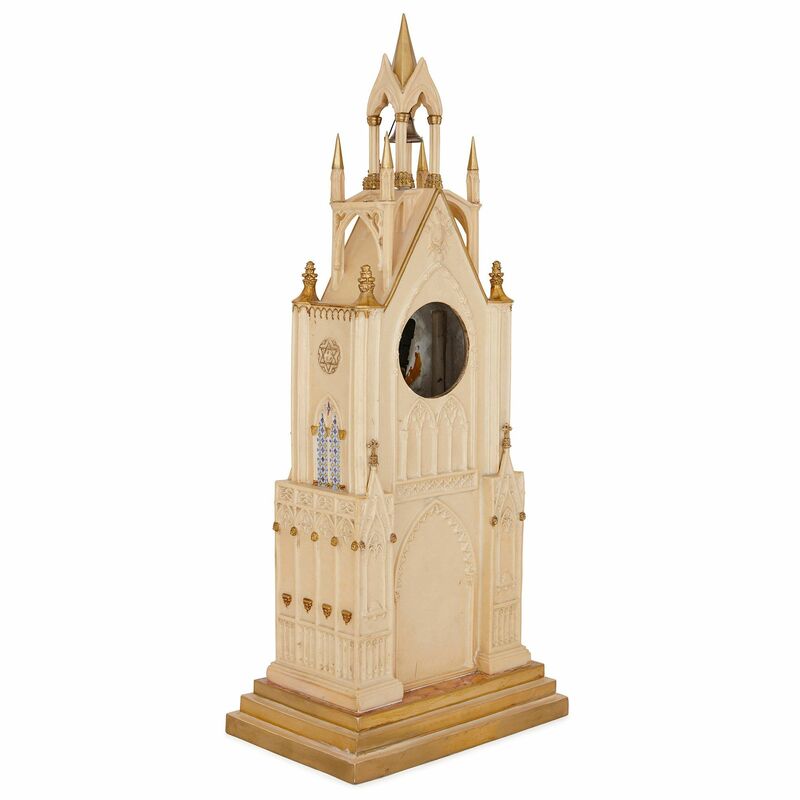 The clock case is formed as a Gothic style cathedral, made of porcelain and set onto a rectangular, stepped, gilt base; with the top surface of the base painted to imitate red, veined marble. 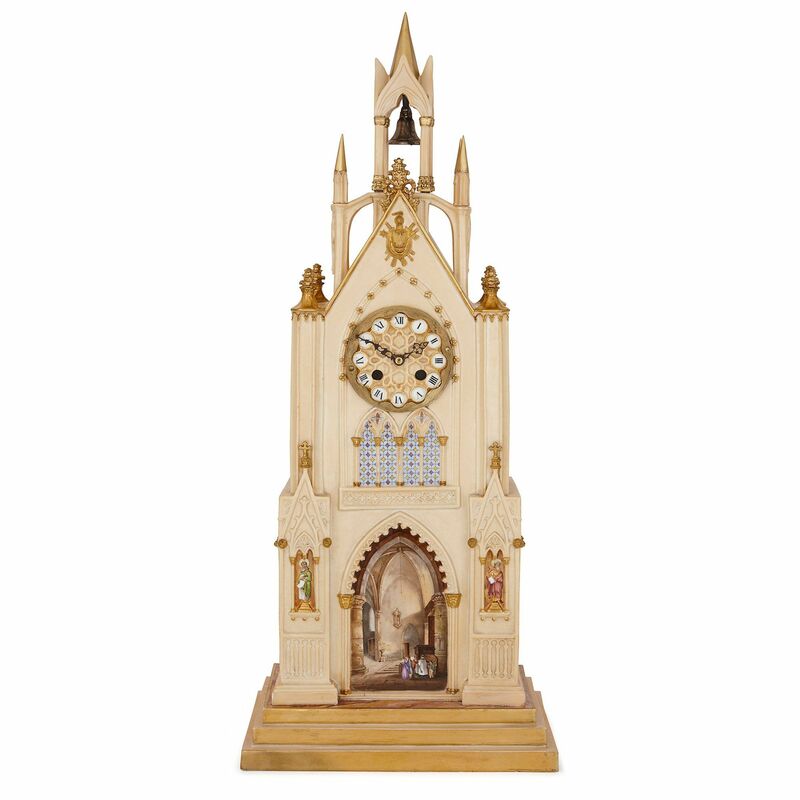 The porcelain cathedral features two architectural tiers and a surmounting clock tower, and is coloured predominantly with a cream, stone coloured ground and decorated with gilt highlights all over. 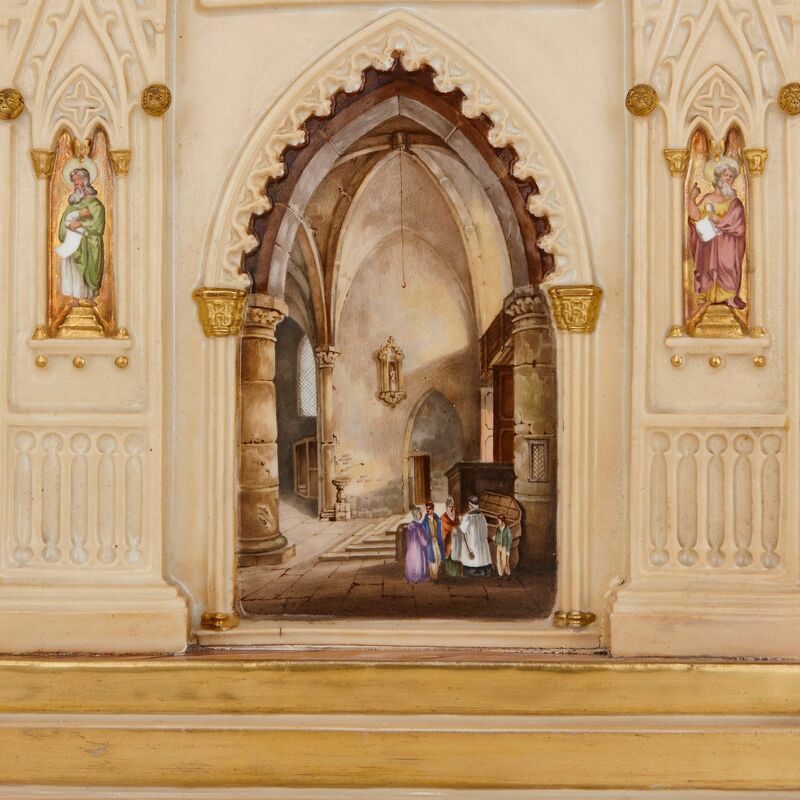 The lower tier features a central arched doorway which contains a trompe l'oeil painted scene of figures in the arched interior of the cathedral, flanked on each side by a painted trompe l'oeil stained glass window depicting a saint within a fluted pilaster, and Gothic style arched architectural decorations all around. The upper tier features trompe l'oeil stained glass windows decorated in yellow and purple on a sky-blue ground. 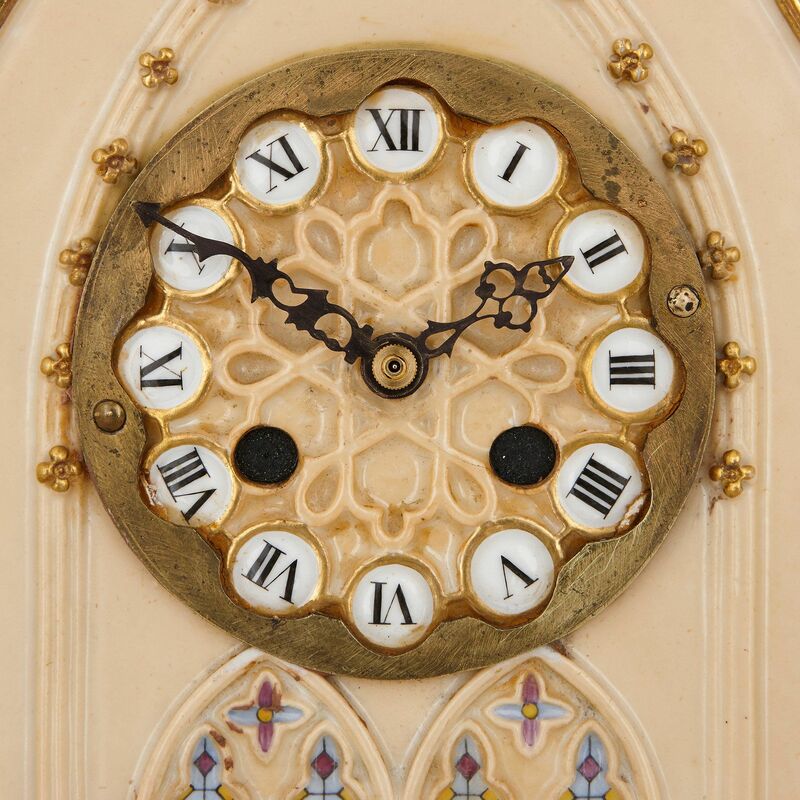 The circular clock dial is set above the painted windows to the front of the piece, and features a gilt metal border and twelve circular enameled panels each with a Roman numeral. The centre of the clock dial features an intricate interlaced design, and the dial is surmounted by a pointed pediment with a gilt crest and bow, and is flanked on each side by two gilt turrets. 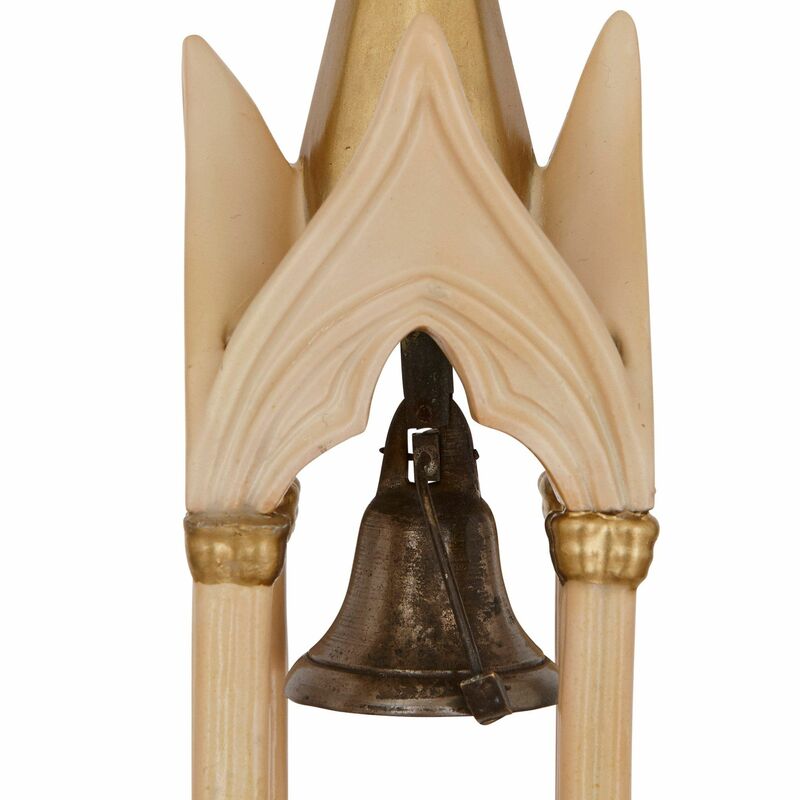 Surmounting the pediment is the clock tower, which features a central hanging bell beneath a pointed and parcel-gilt canopy and narrow, flanking pointed turrets. The clock is the work of Paris based porcelain factory Dagoty et Honoré, which was established in 1810 between Pierre-Louis Dagoty (French, 1771-1840) and Edouard Honore (French, active early 19th Century). 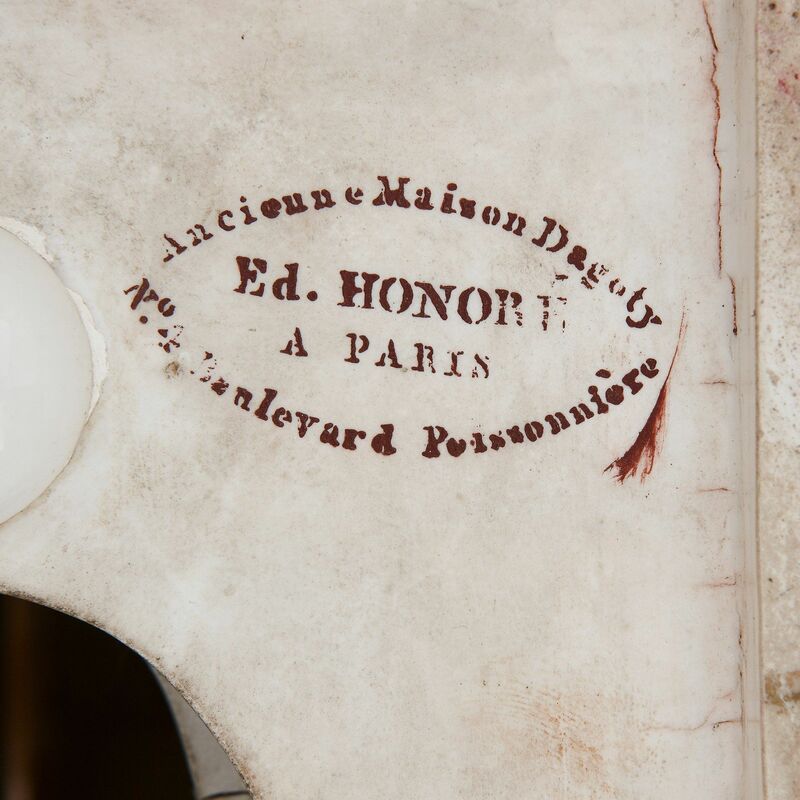 The clock is signed to the underside with an iron-red stencilled mark reading 'Ancienne Maison Dagoty / Ed. Honoré / A Paris / No. 4 Boulevard Poissoniere'.